The other day I was grabbing piles of catalogs and Black Friday fliers and late-to-postmark political advertisement slicks (for all I know. Seriously. I keep getting these and that was so last month) and among those was a brightly illustrated large envelope. Assuming it was a faux key to a local car dealership running some shenanigan promotion, I was majorly close to tossing the package. Last second I decided to glance at whatever junk was inside, and BLAMMO. I basically committed mail fraud because the letter was so totally not addressed to me. Again this year I utilized the thorough and fear-inducing positive-attitude-motivating site and service, www.packagefromsanta.com! Killer met it with her typical suspicion and then excitement, whereas the Moose experienced nothing short of pure elation and joy. Kid almost pooped himself, he was so excited! 8 1/2 x 11 photo of Mr. Kringle - perfect size for framing and adding to your Pinterest-worthy hallway gallery wall, ya'll! Special shipping label addressed to your child - not to you. See the above paragraph. Do not commit a federal crime by opening your kids' mail. Duh. Personalized video greeting from Santa! Plus, you have the option to upgrade to even more goodies - and trust me, there are a lot more options to spoil and/or scare your kids to death. Packages start at $14.95, making this a great affordable gift for a friend's child - it isn't just another dang thing to get broken in a few days, it's an experience that years from now they'll remember and think about in a non-jerk way. AND AND AND! 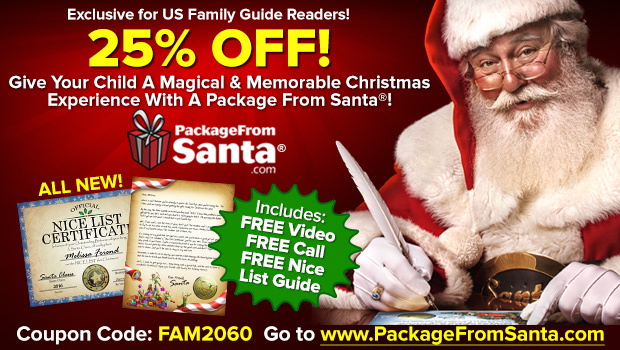 My readers get 25% off at www.packagefromsanta.com using code FAM2060! Bam!